Sprawled over 35 acres of luxurious gardens, and in close proximity to the Taj Mahal, ITC Mughal, a Luxury hotel in Agra is a fitting tribute to the great Mughal builders of the past. This luxury hotel in Agra comprises of 233 opulent rooms and suites, recreating a paradise for the contemporary Mogul - full of splendor and perfection which was the hallmark of the Mughal Dynasty. ITC Mughal offers the finest leisure destination in the historic city of Agra, for an unsurpassable experience of Royal Indian hospitality. True to its stately inspiration, ITC Mughal expresses the untrammeled luxury of a Royal Refuge, with its 5-star luxury accommodation, acres of gardens that bear the mark of the paradisiacal landscaping typical to Mughal gardens with the use of water channels, fruit, and flower bearing trees and shaded walkways. 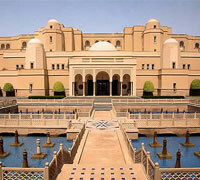 Enjoy the wealth of Indian history and culture at Agra's Taj Resorts. Situated right next to the majestic Taj Mahal, the ultra-modern centrally conditioned hotel is easily accessible from all tourist spots in and around Agra. The rooftop swimming pool and Taj Terrace restaurant are ideal to unwind and relax. 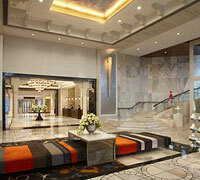 Our contemporary hotel is perfect for both tourists and business travelers. 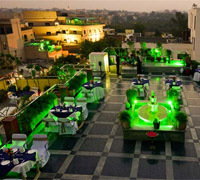 Enjoy your meal with a clear view of the Taj Mahal in our rooftop restaurant. Subdued lighting and soft soothing instrumental music lend an air of relaxed well-being and serenity that makes meals truly memorable. The Oberoi Amarvilas, Agra enjoys an unrivaled position amongst luxury hotels in Agra, is located just 600 meters from the iconic Taj Mahal. Each of our rooms affords uninterrupted views of this ancient monument to love, while elements of the layout and design pay homage to its Mughal splendor. By day, guests can travel in our private golf buggies to the Taj Mahal. At night, they can savor a candlelit dinner beside its soft silhouette. We offer a range of specially curated Oberoi Experiences designed specifically for our luxury resort in Agra and this majestic Mughal city. Guests looking for a luxury dining restaurant in Agra can choose from our two restaurants and their distinctly different flavors. Bellevue is brightly lit, open all day, and serves Indian and continental cuisine. Across the hallway, our Indian specialty restaurant, Esphahan, offers candlelit dinners accompanied by live traditional music. Our poolside terraces afford starlit private dining. 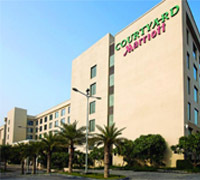 Treat yourself to 5-star elegance at the Courtyard Marriott Agra. Completely new and ideally located near the Taj Mahal and other renowned India attractions, our hotel is ideal for a business trip or a relaxing getaway. Guests staying at the hotel don't have to look far for great dining, thanks to our four on-site options. Sample from the delicious buffet at MoMo Cafe or MoMo to Go. Enjoy succulent Indian barbecue at ANISE or innovative cocktails at Onyx Bar. Meetings and events at the hotel are extraordinary; our expansive outdoor lawn provides a beautiful backdrop for outdoor weddings, our indoor venues are as versatile as they are elegant. Stay fit with our fully-equipped gym, an outdoor pool, and a spa.